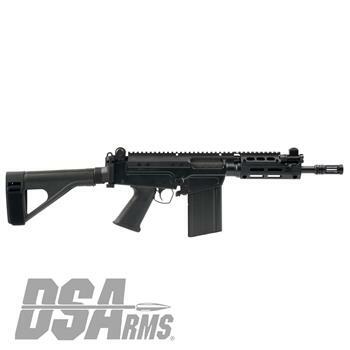 The DS Arms SA58 I Series of rifles is an improved and enhanced development of the tried & true and very successful FAL rifle in caliber 7.62x51mm NATO. Together with the historical features, reliability & ruggedness of the FAL design and the newly developed DS Arms modern upgrades the new DS Arms I Series of rifles has truly joined the past with the present to create the best battle rifle ever manufactured. Available with several different barrel lengths, this fully adjustable gas piston operated firearm allows for easy gas adjustment and easy takedown and cleaning. All I Series models (except the I.B.P. - Improved Battle Pistol) come standard with our B.R.S. - Battle Rifle Buttstock that still allows the rifle to "Fire While Folded". The B.R.S. features side folding and L.O.P. adjustment buttons that are very ergonomic and ambidextrous. There are 7 length of pull positions making this stock comfortable for any shooter. The cheek-piece adjusts without tools, levers or turning wheels giving the B.R.S. a sleek profile and simple operation. The cheek piece features a full parallel rise with (4) 1/4" settings; and also a tilted/angled setting for use with head/helmet mounted devices or for when the shooter needs more clearance on the cheek piece. Chambered in 7.62x51mm NATO the DS Arms SA58 I Series of rifles allows the user to experience real downrange power in an extremely durable and reliable firearm. An ambidextrous magazine release, larger trigger guard, modern pistol grip and extremely ergonomic non-reciprocating left side charging handle allows any user to take full advantage of the time tested FAL rifle. The receiver features a MIL-STD-1913 Picatinny Extreme Duty Scope Mount top cover to enable the mounting of a wide variety of optics. The handguard is a slim profile M-LOK compatible design that aids in weight reduction and barrel cooling and allows the user to configure the rifle by mounting the accessories in many places without the bulk and weight of a traditional 1913 quad rail handguard. Whether used for target shooting, homeland defense, competition or LE & Military Deployment the DS Arms SA58 I Series of rifles has all the features you want and expect from the best battle rifle ever manufactured, without taking your chances in a flimsy untested rifle design. Matte Black Dura Coat Finish Included. Forged 7075-T6 Aluminum Lower Trigger Frame. Barrel Features Mil-Spec Phosphate Finish. Barrel Is Threaded 5/8x24 Right. DS Arms WarZ Series Extended Length Flash Hider. DS Arms M-LOK Interface Pistol length Handguard. DS Arms SAW Style Pistol Grip. DS Arms Extended Ambidextrous Magazine Release. DS Arms Extended Winter Trigger Guard. Left Side Non-Reciprocating Extended Contour Metric Cocking Handle. Elevation Adjustable Protected Front Sight Post. Dual Aperture, Adjustable Windage PARA Rear Sight. DS Arms Extended Extreme Duty Scope Mount. Gun Case & Owners Manual. Not available for NY, NJ, MA, Washington D.C., CT,CO, CA or HI. Overall length 21" with arm brace folded. 28.75" with arm brace opened. Overall weight 8.4 lbs without magazine.